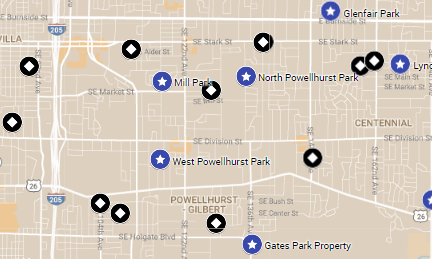 Grow Portland leads the effort to identify and develop five new community garden locations in East Portland. Grow Portland is helping to identify and plan five new community garden projects to be constructed over the next five years in partnership with the City of Portland Community Gardens, a program of Parks and Recreation. Our work is focused in the city's most ethnically diverse and highest poverty neighborhoods east of 82nd Avenue where community garden space is in high demand. The first garden project is underway at Wood Elementary School, a Centennial School District Site near SE 172nd and Powell. Our partnership will help serve around 300 new limited-income families over the next five years. Grow Portland completed a comprehensive analysis of 90 City and school district properties with the potential for community gardening. This work was funded by the East Multnomah Soil and Water Conservation District. Garden locations are chosen based on their site suitability, access and proximity to low-income residents and people of color. We will work with historically underserved communities, including immigrants and refugees, to create a more even distribution of gardens.